When Lyft came on my radar I knew it was a game changer for elderly drivers. Now fast forward a handful of years and we are seeing the company forge partnerships with health care providers. However, if you are an adult child or work with older adults adoption of ridesharing is a tough sell. Recently I seized the opportunity get my elderly friend to take a Lyft ride. Perhaps cajoled might be a better description. In fact, it took me about 20 – 30 minutes to convince her to try ridesharing. The destination, a local restaurant a few minutes from her home. Seeing that most of her travel is within 15 minutes from her home it was ideal. In spite of her resistance I persevered. “I can drive she explained.” Yes, you can I replied. “It’s so close” she added. Yes, a perfect opportunity to for a ridesharing experiment I countered. Prior to this conversation, I had been planting the seeds of ridesharing. Finally, with gentle persuasion, she agreed. After agreeing to try Lyft was the actual process of using the ridesharing app. First, finding her magnifying class so she might easily read the screen. Second, identifying the elements of the app on her smartphone screen. Next, the breaking down the steps to request a ride. Then it was asking her to request her first Lyft ride. During this 20-minute coaching process, her emotions went from skeptical to excitement during the first ride. This is an adventure she exclaimed. When the car arrived she beamed at me and said this is like magic. When it comes to ridesharing it may take some time to adopt the habit. However, the benefits to elders outweigh the learning curve. At the present time, I am the Director of Program Innovation at Advocates For Aging. When you think of older adults do you see America’s largest resource? With this in mind, I combined my background in business with a desire to influence aging in America. For this reason, I was the first Gerontologist to speak at South by Southwest. Furthermore, it’s why I wrote Freewheeling After Sixty. 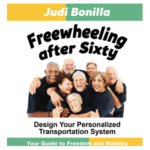 Freewheeling the first book to empower older adults about their transportation choices.